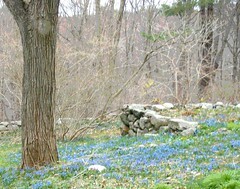 I took the original photo of these blue flowers during a recent walk at Long Hill Gardens here in Beverly, MA. Tonight I cropped the photo to get this composition, and then posterized the image in Painter. The blue flowers are just forget-me-nots, not that unusual. But to see them cover the ground like this seems magical to me. This image began with a photo taken last week during an excursion to Newburyport, Massachusetts. I was sitting in my car in a parking lot, almost ready to leave. 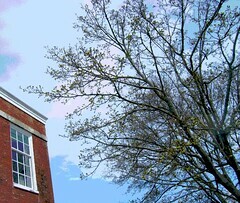 I noticed a tree leaving out, and I liked the contrast with the brick building (typical Newburyport architecture), so I took a quick picture. Later I noticed that the tree was festooned with electric light bulbs and wire. So tonight I opened the image in Painter and used digital pastel to restore the tree to its natural state. I also cleaned up the window a bit, then posterized the image, cropped it, and here it is. During a very early ride into Boston this morning, I caught a glimpse of the sun rising behind the Zakim Bridge. It was absolutely gorgeous! But for once, I didn't have my camera with me. I suppose I could have used my cell phone cam, but it was buried in my bag. Anyway, even though I was in the passenger seat, I was on the wrong side of the car to get a good shot. But the image stayed with me. Much later, on the way home, I had an idea of how to try to recreate the feeling of that amazing sunrise. So tonight, I found a picture of the Zakim Bridge that I took back on February 9th, in full daylight. I opened the February 9th photo in Painter, then used the "magic wand" tool to add color overlays between the "strings" of the bridge. Then I posterized it. I won't pretend that this is even close to the beauty of the sunrise I saw today. This isn't meant to be a literal reproduction of that sunrise, but I think it captures the hope and optimism that moment provided as I glimpsed natural and technological beauty coming together. This is another photograph that I took during a recent outing to Long Hill Gardens (here in Beverly, MA). I love to see the bright yellow blossoms of forsythia so I took some pictures, then cropped this one tonight to get this composition. 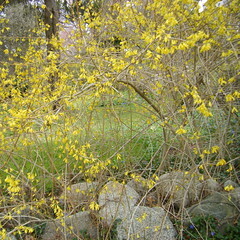 Forsythia is a sure sign of spring. Earlier in the week, I was in Newburyport, a side-trip for breakfast after a trip to the vet. I noticed this beautiful church tower and decided to take some pictures. 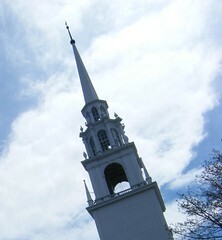 (This is the Unitarian Church, I believe.) The original photo that I took was at an odd angle, but I decided that I liked the effect. The top of a very modern street lamp was ruining the composition, however, so I opened the image in Painter and did a little cut and paste to solve the problem. 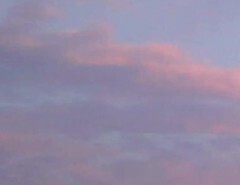 But the (amazing) sky is exactly as it was captured by the camera. 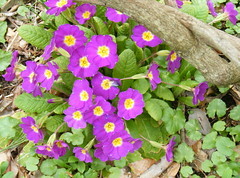 On a recent walk at Long Hill Gardens, I saw some primroses, peeking out from beneath a branch. I loved the colors, so I took some pictures. Tonight I cropped one of the photos to get this composition of primroses on the path. 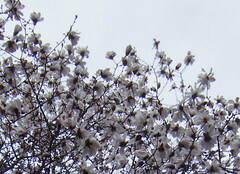 Here is another view of white magnolias from a recent walk at Long Hill Gardens. 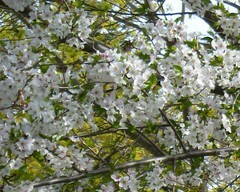 I took a photo of the tree from a distance, and it is a large tree, and this is cropped from the original photo. I adjusted the exposure and the colors to make sure that the pale blue sky could be seen clearly behind the blossoms. This image began with a photograph that I took several weeks ago at the Meadowbrook Farm Stand here in Beverly, MA. Out in front there was a big display of tulips. The tulips looked very celebratory, so I took a few pictures. 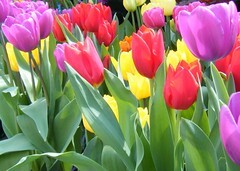 I immediately knew that I wanted to use the picture of tulips for an April birthday that was coming up. Later, I cropped the photo to focus on the tulips, and yesterday used the image to create the e-mail birthday card, using a template in my new Mac mail program. Tonight, I loaded the image into Flickr, and decided it could use just a little more cropping, so I trimmed it on line, using Picnic. 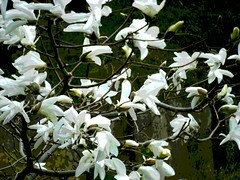 I used my Painter program to create this posterized version of the photo of white magnolias that I posted two days ago. This version emphasizes color, adding some subtle shades of pale green to the blossoms and darker shades of green to the background. I like all three versions, but I think I like this one best. I used my Painter program to create this digital woodcut from the photo that I posted here yesterday. I took the photo of white magnolias during a recent walk at Long Hill Gardens, here in Beverly, MA. I tried to use a subtle black outline to emphasize the graceful shapes of the branches. I also created a posterized version of the original photo, and I plan to post that tomorrow. On a recent outing to Long Hill Gardens (in Beverly, MA), I saw a white magnolia in bloom, so I took a few pictures. This is the best of them, cropped just a bit to improve the composition. I liked the white petals against the darker background, so I also used Painter to create a posterized version as well as a digital woodcut. I plan to post those versions here over the next few days. This is a collage and decoupage project in progress. 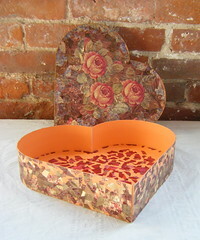 The heart-shaped box once held a Mother's Day gift from my daughter, and I have been (slowly) covering it with collage and decoupage patterns created from printed metallic ribbons. I went up to the studio first thing Friday morning and continued to work on the red area (interior) and the gold area around the outside. Progress is slow, but it is progress. And the process itself is calming, almost like a meditation. 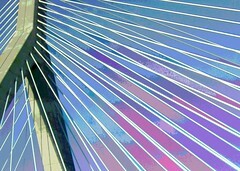 This image is cropped from a photograph that I came across today in my Blackberry Pearl. I took the photograph back in July. Once I transferred the image into my computer, I realized that it was a duplicate, meaning that it was already in my Mac, but that was fine because I wanted a close crop of it anyway. So this closeup is the composition I was after; I used iPhoto to intensify the colors just a bit, and I also enlarged resized the image. The result looks a bit like a painting, but then, sunsets always do, which is one of the reasons I love to look at them. And no matter what is going on, looking at a sunset makes me feel more peaceful. 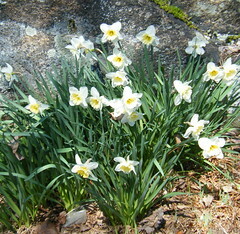 I have seen these pale daffodils in bloom every day for nearly a week now, passing them as I go to visit my daughter. I love the way the blossoms look against the rock, and have been meaning to take a picture. And finally, I did! A recent outing included a stop at a Meadowbrook Farms, a local farm stand. Here north of Boston, there are lots of little farm stands and you can really tell it is spring when they open their doors and put flowers out on display. I took a picture of a huge table full of pansies. 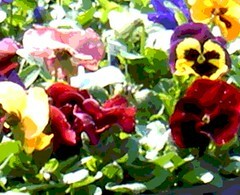 Tonight I did a very close crop of some of those pansies, and then posterized the image in Painter. I used my Painter program to create this posterized version of the image I published here yesterday. The original photo was taken at Long Hill Gardens in Beverly, MA. This week, little blue forget-me-nots are creating carpets of blue in the wooded areas alongside the road. This image began with a photo that I took during a recent trip to Long Hill Gardens (aka Sedgewick Gardens) here in Beverly, MA. 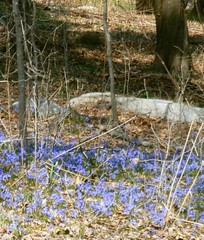 Blue flowers (forget-me-nots, I believe) are coming up all over the place, including wooded areas near the path. It took my breath away, coming upon this from a distance! It looked like a carpet of blue under the trees, quite magical, like something out of a fairy tale! So I took some photos. Tonight I cropped one of the photos to get the composition I wanted. Then I saw two small areas with some clumps of dried leaves that were just in the wrong place, so I opened the image in Painter, and corrected the problems with a little magic of my own, some cut and paste and a little digital pastel. I also created a posterized version of this image, which I plan to publish here tomorrow. This is a digital sketch that I drew a few years back, at a family gathering in New York City. I have a drawing program (Pocket Artist) on my handheld computer (PDA). I was showing the program to my relatives, and I began to sketch my cousin Mindy. This image is the result. 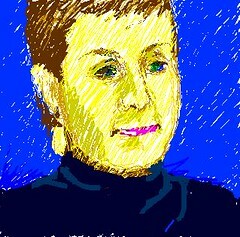 Well, today, this portrait came up during a phone call to Mindy. We were talking about art and using computers for art (which we both do). I said that I want to synchronize my PDA with my new Mac because I love the Pocket Artist Program. That's when the subject of this little portrait came up, and as we talked, I realized I had never sent her a copy of this sketch, so I did that this afternoon. I also asked her if it would be okay to post the image here tonight. She kindly consented, so here it is. This is a revision (and final version) of an image that I posted two days ago, a digital drawing made in Painter. 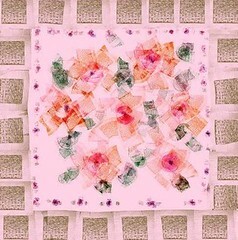 I used the "pattern pen" and the pattern I selected was "Matza," made from one of my posterized photos. Well, when I began the image, I was just experimenting, but I was surprised at how much I enjoyed the result. But the border was bothering me. So today I opened the image in Painter again, and used some cut and paste (and a little digital pastel) to straighten out the border. I wanted it to look just a little more symmetrical than the original version, but not perfectly aligned, because I wanted to preserve the sense of liveliness and movement. Earlier in the week (Tuesday morning, to be exact), I finally had a chance to go to the studio, so I worked on this project for an hour or so. 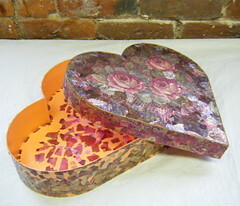 This heart-shaped box once held a Mother's Day gift from my daughter. Now I am covering it in decoupage and collage cut from printed metallic ribbons in a variety of floral and paisley patterns. I continued to work on the inside of the box (red area) and the outside (gold area). I made some progress, and would have liked to stay longer. But it has been a very hectic week, so I am just glad I made time to fit this in, and also glad that I am finally getting a chance to post this image. Tonight I made this design with Painter's pattern pen, using the matza pattern that I created last night. You can see the matzas clearly around the edge, but every single brush stroke of the flowers and the rest of the design are made from the matza pattern. I guess this proves that although you can't use flour on Passover, you can make flowers out of matza! This little light-hearted design is in honor of the Seder being held at the White House tonight! Wow, is this night different from all other nights! 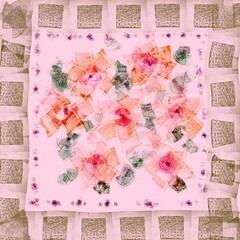 This digital pattern is made from an image that I posted here last spring ("Matza" on April 25, 2008). Last year, my photo of matza was a very late idea for a Passover image. Very late in the game, (and in the holiday) inspiration struck as I was buttering a piece of matza, on a paper towel as usual, so it wouldn't shatter into thousands of pieces as it does on a plate. That's when I realized that I was admiring the contrasting textures and shapes of matza and paper towel, so I took a photo, and then posterized it. In last year's post, I mentioned having also created a pattern from the image to use for Passover greetings in 2009. So yesterday I looked for the pattern. But since last spring, I changed over to a Mac and apparently my old pattern files for Painter are nowhere to be found. 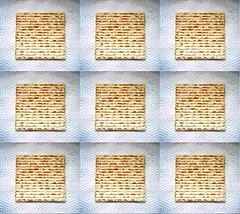 (Something else to search for, besides the Afikomen. . . .) So, instead of searching, I began again, opened the "Matza" image in Painter, created a pattern, and used it to make this image of "Lotsa Matza" which I will use to send holiday greetings to family and friends. I used my Painter program to create this posterized version of the photo that I posted here yesterday. I took the original photo during a recent trip to Whole Foods. I was admiring a display of mineolas, with leaves and stems still attached, so I decided to take a picture. 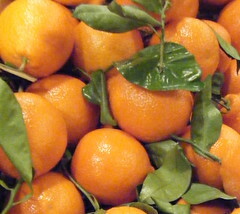 I think that posterizing seems to intensify the colors of the fruit and adds a little more shine to the leaves. Beauty can be found at the grocery store, so don't forget to look! On a recent trip to the grocery store, I saw a beautiful display of mineolas, with stems and leaves intact, so of course, I took a picture. Tonight I cropped the photo to get this composition. I also used Painter to create a posterized version of this image, which I plan to post here tomorrow. 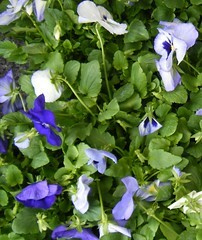 Here is another photograph of pansies, taken a few days ago outside the grocery store. I was excited to finally see pansies on display. These were in a flat on the ground, so I just took a quick picture. Tonight I edited the result in iPhoto on my Mac, and cropped the picture to get a closer view. After I uploaded the image to Flickr, I decided I wanted to crop it just a bit more, so I used Picnic so I could modifiy the image without having to delete and upload. I'm glad I did the second crop because I like the composition much better. 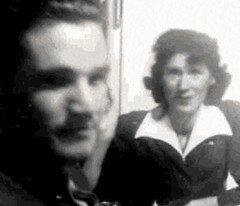 This image began as a snapshot from my mom's old album, which begins with her first date with my dad in January of 1943. He was stationed in Pueblo, and they met at a USO dance. My mother's album records these events in photos labeled with notes written in white ink on black paper. That's how I know that this photo was taken on February 24, 1943, after they had gone to see "Road to Morocco" on a rare "day off" for my father. That's also how I know that they went back to my mom's house afterward, and that soon afterward, another soldier dropped in unexpectedly. (Did he come to see my mom? My aunt? Was he a friend of my dad? Perhaps less likely.) Because there were several snapshots of this event in the album, I know that there were four people around the kitchen table: my mom, my dad, my aunt, and the second soldier. My aunt must have taken this snapshot because she is the only one of the four not in the picture. From what my mom wrote in her album, I can tell that time alone together was hard to come by. My folks met in January, and married a few months later, fitting all that in before my dad was shipped overseas. So when I edited this snapshot today, I cropped out the cups and plates on the kitchen table, but I also cropped out the second soldier (though with regret). Then I used Painter to posterized the image and added some color overlay as well. I like the idea that I have created a moment alone for the two faces whose features are now blended in my own. My parents were married on April 4, 1943, so this is a way that I can still celebrate their wedding anniversary. 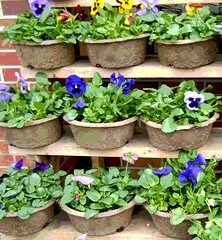 Yesterday I saw a display of pansies outside the grocery store, so I took a picture. Tonight I cropped this image out of the original photo, then used Painter's digital airbrush to cover up the price tags on the pots. Then I posterized the image. It's a cold spring, here north of Boston, with temperatures in the high forties, maybe fifty degrees on a good day. But even so, some brave flowers are already appearing. This image began with a photo I took during a walk this week at Long Hill Gardens (in Beverly, MA). 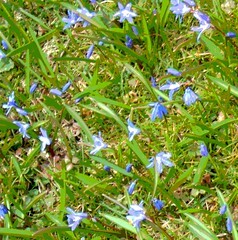 Some of these tiny blue flowers are starting to appear in the grass. (Later, they will carpet some areas under the trees.) Tonight I cropped this composition out of the original photo, and then posterized in using Painter. 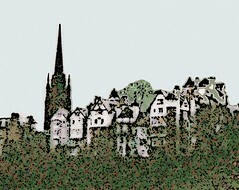 Here is the third of three digital woodcuts created from photos that I took several years ago during a trip to Edinburgh, Scotland. Like the images posted here yesterday and the day before, this one began with a photograph that was too dark and out of focus. Tonight I cropped this composition out of the original, then opened the image in Painter. I adjusted the contrast, then created a digital woodcut. I used color overlay to add color to the sky, and contrast to foliage behind the rooflines. Now, this might seem like a lot of trouble to go to for photos taken in late afternoon light with a disposable camera. Why do it? Well, I like a challenge. Besides, I am willing to assume that I must have had a good reason to take those photos, even knowing that light wasn't ideal and the camera was very limited. I am willing to assume that there was something there that I really wanted to capture. (In fact, sometimes there is an inverse relationship between my excitement about the scene and the quality of the photo.) In this case, I think I found what I was hoping to capture that afternoon in Edinburgh when I took pictures of the houses on the hillside.